One of the vivid memories of our house in Gympie Australia after we’d moved from Macintosh Creek farm in the early 50’s was an assortment of vehicles parked in the adjacent lot we owned next door. Eric had supplemented his interest in rural properties with his newest acquisition, a timber business. Somehow in trading out of near bankruptcy he’d acquired a few trucks, horses, lumberjacks and sundry lumber working gear as a trade in on one of his properties, and as he was ever looking for new interests threw total attention into the timber trade for a time. Contracts were with the government forestry department. When timber plantings were at half maturity forestry workers marked every second tree, and these were cut to make way for the trees destined to reach eventual lofty maturity. There were serious penalties for damage to remaining trees, so extreme care had to be used in extraction of the marked ones. These were locally referred to as “thinnings,” because removed trees provided further space for saved trees to grow. “Thinnings” were carefully manoeuvred through standing timber by horse to avoid damage and resulting penalty, and “snigged” to the roadside ready for loading on Eric’s semi-trailers. Using tractors in those confined spaces and slopes was considered risky as it could damage trees. Trailers not in use were constantly reversed into the adjacent lot and expertly parallel parked waiting for the next scheduled trip. As an early teen I used to watch the skilful way drivers parked their trailers, and that no doubt gave me an interest in trucks and trailers when it was time to do compulsory army training in the mid 50’s. After terrorizing army instructors as I learned to drive the big ones in busy streets of the state capital I eventually acquired my licence for a whole range of large vehicles. But I was only assigned to drive transport trucks and jeeps for the duration of my army national service training. Perhaps my instructors had passed the word around? In addition to timber rigs Eric kept his interest in trading vehicles, and would frequent auctions looking for a bargain, spend a little to gussy up his acquisition and sell privately. So there was an assortment of cars scattered among the rigs at any given time. Some of these were rare finds which would bring a fortune in today’s collector market, but in those days they were just another commodity to trade. 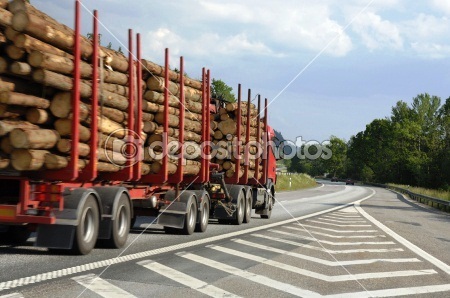 I remember the day when Eric asked me to accompany him to the forestry to collect a load. Some of his drivers were sick and contract deliveries were not being met on time, so remaining workers were working overtime to try and cover shortfalls in delivery. Eric decided to help out. Up to this time he’d watched the men at work, but hadn’t loaded up before by himself, so this was to be a new experience. He took one of the older rigs which used a winch to load the trailer rather than his flat bed trucks with cranes. I’d not been deep into the forests before. Logging roads were narrow, winding and steep and meeting a truck going in the opposite direction required considerable time backing loads to a cleared space in the tree stands. It looked like this was to be our lucky day. No trucks coming our way. Eric did a fairly good job manoeuvring the rig into place beside logs stacked by the roadside. The load was rolled onto the semi with relative ease, but then had to be positioned so it was evenly weight distributed. Here is where the winch became necessary, and here is where things began to go wrong. The logs had been secured together with chains, and the winch chain was fixed to bring the whole load forward for balance. Eric peered through the rear window and engaged the winch. The logs eased forward and Eric looked pleased as he pushed the lever to disengage. He mentally congratulated himself on loading up for the first time. But the winch lever jammed and the load continued to inch forward pushing the cabin in and pinning Eric behind the wheel. Miraculously the winch reached the end of its tether and the motor stalled, and logs retreated with cabin a few inches backward. Eric was gasping for air, but the pressure was off and there was now a few inches clearance between his body and the steering wheel. We were miles into the forest and no help could be expected. Gasping for breath he disengaged the winch lever and started the motor. Knowing his son couldn’t handle the situation he moved forward slowly inching through the forest and joined the highway into town gasping for breath and grimacing with pain but resolved to get us back safely to civilization. There was no thought of taking that load beyond our home where medical attention could be sought. The rig sat out on the road near our home for some time waiting for one of Eric’s men to come to town. Eric was in acute distress and still gasping for air when we arrived home. An ambulance was called and it was discovered ribs had been broken and severe bruising resulted from that accident. By some miracle lungs were not penetrated and after weeks of painful recovery Eric was back in business again. The old truck didn’t survive. It was rapidly traded for a new one, and winches became a relic of the past. Later as I learned to drive the big ones in army training I kept my Father’s experience clearly in mind and treated winches on army trucks with great respect and suspicion. Next Post Poppy Fields . Yes he was confined to bed for a long time after that experience. A painful lesson…but well learnt, unlike people who insist on making their own mistakes. Yes it was a painful lesson, and you are right. We do insist on making our own mistakes as human beings and it’s lucky some of us survive our experiences.